​EA Sports and FIFA 19 just released a new update called Winter Refresh and it has FIFA fans going crazy. The new update includes the first group of 'Prime ICON Moments,' which is a brand new item that celebrates a specific moment in an ICON's career. There will be 34 select ICONS released in FIFA Ultimate Team and each will have a special Prime ICON Moments version which will also be released throughout the Winter Refresh. Furthermore, even more select ICONS will be released during the course of FUT 19, but some of those will not have a Prime ICON Moment card. Regardless, you will have plenty of opportunities to grab one. The Prime ICON moment items represent the highest rated version of each ICON in FUT 19 with certain ratings upgrades that are based and inspired by their specific Prime ICON moment. 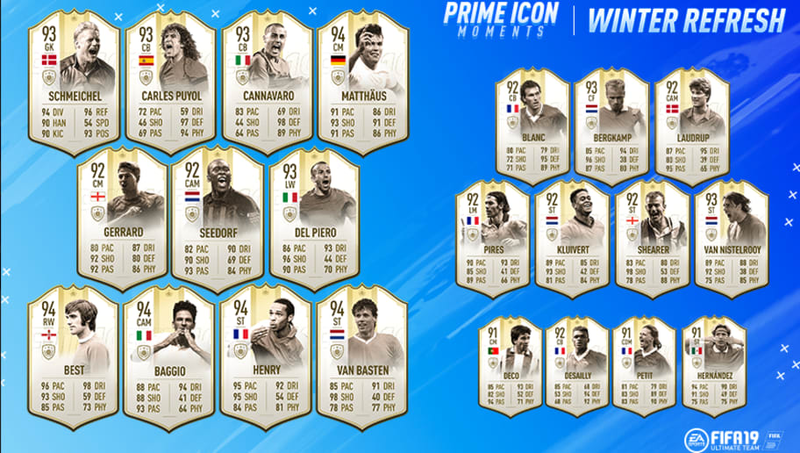 There were 22 Prime ICON Moments released today, and a few of the players that are included are Thierry Henry, Steven Gerrard, and George Best. Some other notes on these Prime ICON Moments: There will be SBCs to complete for Prime ICON players; Only select Prime ICON Moment's will receive a Prime ICON moment SBC; FIFA has no plans to introduce more individual Prime ICON SBCs.